March is Women’s History Month. It just seems right that March also marks the anniversary of United Methodist Women! It was March 23, 1869, when eight women gathered at Tremont Methodist Episcopal Church in Boston, Massachusetts, and organized the Woman’s Foreign Missionary Society, what would become United Methodist Women. The women raised money to send a doctor, Clara Swain, and a teacher, Isabella Thoburn, to India as missionaries to serve the women of that nation. Checks sent to United Methodist Women, Treasurer’s Office, 475 Riverside Drive, New York, NY 10115. 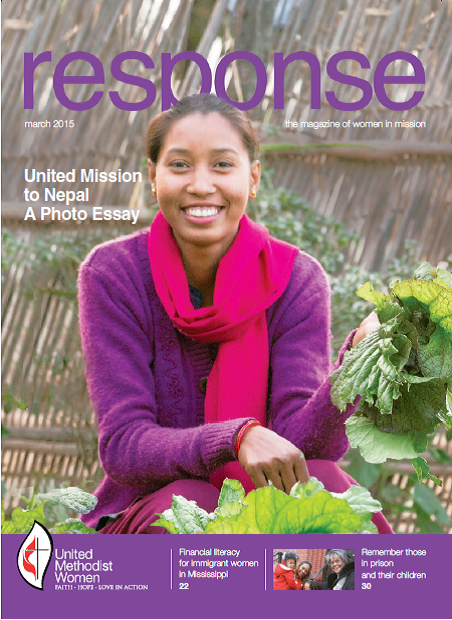 This issue of response features stories of United Methodist Women members at work in local communities while Mission Giving funds help immigrant women in Mississippi and support mission partners in Nepal. This issue of response shows why in 2015, as in 1869, women still need to organize for mission. Let’s make it happen. This entry was posted in 150th Anniversary, From the Editor, Women's History Month. Bookmark the permalink.